Q: Laura, what’s one thing you’re excited to be changing on your menu in 2015? Laura: We will be buying Bristol Bay salmon again this year. Instead of fresh, we have the luxury of getting frozen, vacuum-sealed fillets delivered at the end of the fishing season. We then cure and smoke the fillets, and make a sandwich with cream cheese, green onions, capers, and fresh tomato. It’s delicious. We buy from our local guys, Iliamna Fish Co. They live in Portland, fish in Alaska, and I think are excited to have an outlet for all those frozen fillets. How did you come to source Bristol Bay sockeye salmon, and when did you start doing this? We started in 2012. We started because of Chefs Collaborative’s campaign and work to help stop Pebble Mine. 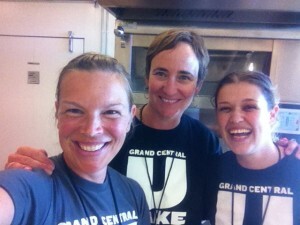 Piper Davis, Grand Central co-owner, was a new board member and we were wondering how Grand Central – as a group of neighborhood bakeries and cafés supplied by a commissary kitchen – was going to participate with the Collaborative’s campaigns. We have different challenges, of course, than a full-service, high-end restaurant. We can’t cook fish to order. I hit upon the idea of a sandwich special that riffed on the bagel and lox combo that my husband and I eat often—cream cheese, capers, thinly sliced onion, lox and a squeeze of lemon. We are not a bagel bakery, so we started with the GCB demi-baguette, and because this is the Pacific NW, we hot-smoked the salmon. It’s been a hit ever since. What’s your purchasing style? Do you buy your salmon all at once at the end of the season, and then use it throughout the year? Yes, typically we buy all the salmon at once at the end of season (once the Iliamna folks are back in town) and use it for the course of the special. Last year, this allowed us to get a pretty good deal; since Iliamna didn’t have to worry about shipping fresh, it saved them multiple deliveries. How much salmon do you go through in a month, approx.? During the time of the special, we went through 650lbs in about 6 or 7 weeks, between 10 bakery-cafés. Did you initially buy fresh salmon, or have you always used frozen? Only frozen. Buying frozen really helps us—we have a large walk-in freezer so we have the storage capacity. As a commissary kitchen, it allows us to recipe to the ups and downs of multiple café orders. It also allows us to negotiate a good deal, since again frozen means fewer deliveries. This fish is so delicious. It is frozen and packaged beautifully. At home I’ve made gravlax and tartar with the previously frozen sockeye, with great success. In the GCB kitchen we simply thaw overnight in the walk-in, or in a sink with cold running water (which thaw the fish in an hour or so). We give it a simple salt, pepper and sugar cure, and then hot smoke it. It couldn’t be easier. And it tastes great. What feedback do you get from your customers about the taste and flavor of the salmon, if any? This sandwich, which we’ve cleverly named The Bristol Bay, is hugely popular. PNW folks are a little nutty about their salmon, and this is the good stuff, which they can tell. What have you learned through getting to know the story of Bristol Bay, and working with its fish? I have found it really satisfying to share the story of the Pebble Mine struggle with employees, especially. To see the connection people make to reading a news story to what’s on their plate—that’s pretty powerful stuff. I’ve been to a few Chefs Collaborative Summits, and have found Paul Greenberg especially compelling. It’s pretty great to be inspired, and then go home and participate, putting your money where your mouth is.